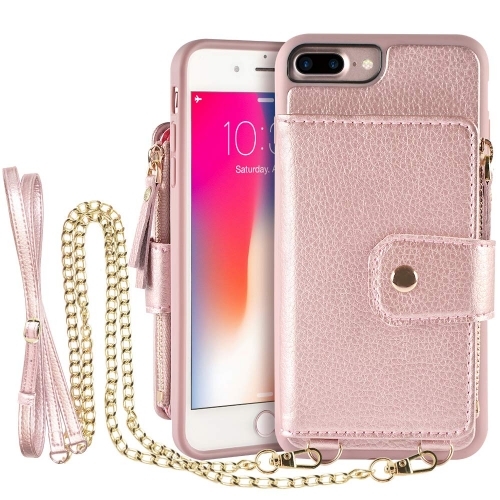 100% Handcrafted with beautiful stitching,soft leather texture and durable TPU,making it comfortable to the touch and a pleasure to look at. ​​​​​Welcome to shop by LAMEEKU and win more Discount. 1. Sign up with us now to get $50 GIFT PACKAGE.Sign up now! 2.Special Offer: Save 10% each on this product offered by LAMEEKU when you purchase 1 or more on Lameeku.com. Enter code “ 4U39D74R” at checkout. ONLY fit for Apple iPhone X 5.8 Inches Display. (2017 Release).100% HADNMADE craftmanship and reinforced stitching makes it even more durable and shockproof.Just designed to simplify your life. 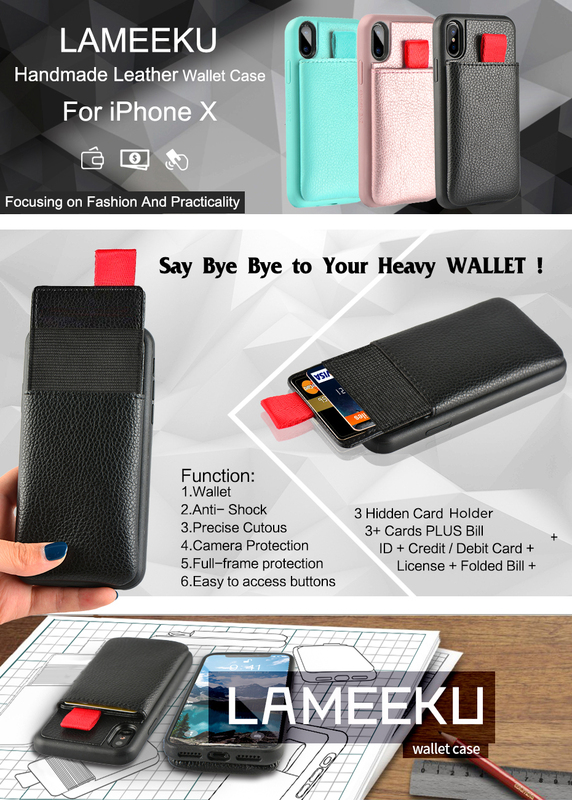 Included 3 hidden card slots, securely holder the cards,easy to take out your IDs, credit card, debit cards, driver's license, or cash. (1)RAISED EDGES and a TPU lip to keep the screen from scratching or touching the ground.Soft-touch cover provides full-frame protection on all 4 corners to protect your phone from drops and dings. (2)The covered raised buttons and cut-out for the speakers, ports, back camera and mute button are perfectly fit the iPhone! By using household aluminum foil inside the leather . Features a unique military grade shielding technology & proprietary blocking material. Provide you Anti-Theft Protection. LAMEEKU customer team would endeavor to win 100% customer satisfaction.If you meet any question, please contact us, we will fix your issue within 24 hours. Been using this case for about a year I have 9 cards stuffed in it and it still holds them snugly. 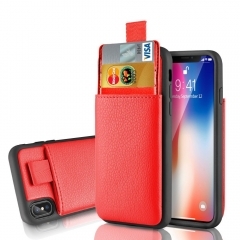 I love this case only problem is that I have cracked 2 screen protector using this case always keep one on and you will love this case if you like carrying your cards with you. My new favorite case. Keeps my ID a card and a little cash neatly concealed and easily accessible when I need it. I don't have to bother with a flap to take pictures or use apps. The sides are great if you drop the phone. I picked up a screen protector with this as well for extra protection. Lots of colors; I got dark brown. Highly recommend this item. It came faster than expected as well. Love the look. Holds enough cards and fits perfectly in my hand for texting or using the camera with the wallet piece getting in the way. I hope it holds up! Great Purchase. If it had a moneyclip I'd say it would be perfect. That being said, it's quality construction and really, really convenient. 1.Can i use this case with a tempered glass protector? 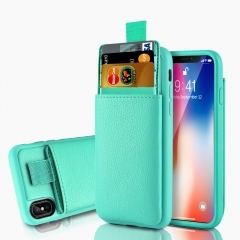 Yes,the case suitable with a tempered galss,except use the phone case,we also suggest use the tempered galss to more protection the phone. 2.How many cards can hold with the case? The case has slots,would hold with 3+ credit cards and other cards. 3.Can i put cash on the case? Yes,you can hold 1 or 2 dollors on the slots after replicate.In order to satisfied customers demand,we have launch the cars&cash cases. 4.Can i use the camera while phone is in the case? Yes, presise-cut and lift-lip camera hole protect the lens against any possible damaes.And keep the photos crise and clear. 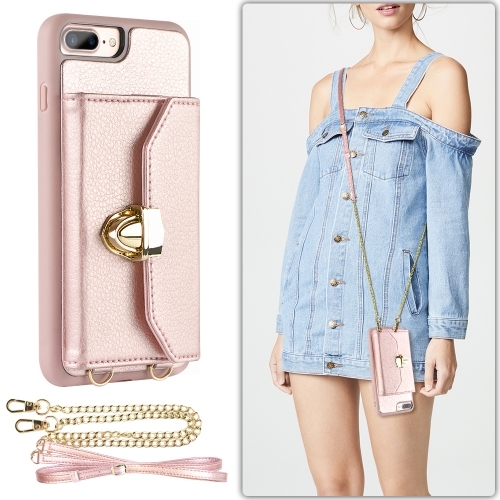 It's make of premium leather+ protective TPU base sheel,very durable. 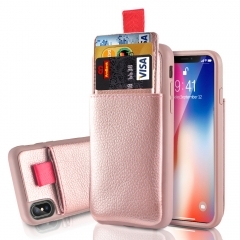 LAMEEKU Wallet Case for Apple iPhone Xs Max, Protective Leather Case with Credit Card Holder Slot Pocket TPU Bumper Compatible with iPhone Xs Max 6.5"